Announcing The Art of the Shim—a new book from Dinah! Hooray! 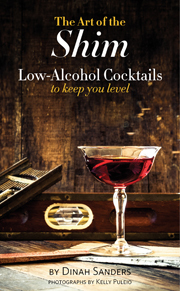 My second book, The Art of the Shim: Low-Alcohol Cocktails to Keep You Level, is now out in hardcover and ebook. Building this book has been a fun time and—due to an aggressive sub-one-year production schedule—a challenge, but the results are beautiful. Kelly Puleio's photography is even better than my high hopes and the production quality on this, the first offset printed title from Sanders & Gratz, is excellent. I'm very happy that the book has the sturdiness to serve its readers many years on their bar shelves. Some of the lessons have been painful. I've now learned the hard way that Amazon's record of a book can apparently get messed up if the release date is before Ingram has their copies on hand—or at least that's the only explanation I can find for Amazon suddenly switching the book's status to "Out of Print–Limited Availability" sometime between midday Saturday and midday Sunday last weekend. We're now on day four of no order button for the hardcover, which is enough to make anyone trying to launch a book tear their hair out. In the meantime, I'm keeping fans of Bibulo.us and the book updated on Twitter and Facebook. Also taking deep breaths and saying "calm blue ocean" a lot. Copies of the book are now in stock at Ingram's Oregon distribution center and lots more will be arriving at their Tennessee one today or tomorrow. Perhaps that will help kick the Amazon status back to normal (though I fear that if their techs don't identify and eliminate the bug, the problem would just come back the next time Ingram or their on hand count hits zero). Next Tuesday (9/17) will be the New York launch at Pouring Ribbons bar and a week from Monday (9/23) will be the San Francisco celebration at The Booksmith bookstore. Looking forward to those events very much! Even with bumps on the road, I'm having a great time as an author and a publisher! Posted on September 11, 2013 Categories Books, creativity, Food and Drink, publishing, work, writingLeave a comment on Announcing The Art of the Shim—a new book from Dinah! This appeared in the Goodreads newsletter as the winner of their May poetry contest. It's tidbits like this that keep me subscribed. Looks like there are a couple of her books of poetry on Amazon, but at least one of them is available through her site (linked above) and she probably gets better compensation if you order through there.